Light return analysis is the newest innovation within the gemological field, and GS Laboratories is at the forefront with OGI Systems Ltd.’s Firetrace light return technology. Light return analysis describes how well a polished diamond will return light to the viewer. A diamond that is cut and polished to produce a high level of light return will typically be visually appealing. The intense sparkles or light and the contrasting dark areas you see when the diamond, the light, or the observer moves. 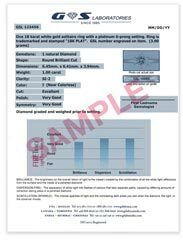 Firetrace is available on all unset diamonds – the Firetrace light analysis results can be included on any GS Laboratories’ Diamond Certification or Jewellery Appraisal Certification report.